In the Virgin Mary, God revealed His power in a way we cannot rationalise but in faith believe. God took flesh in the way that spoke of His patience down through the ages and in The Immaculate Conception revealed His choice, reminding us that through her Son we too are called and chosen. 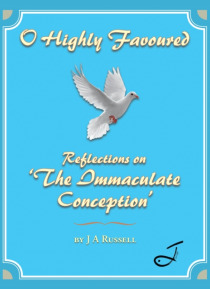 God not only presents the holy Virgin as a model of discipleship, but reveals ever more of Himself through her.… This book traces some of the steps taken by the Mother of God and how, in a world all busy and rushed, she reminds us that we too are called to listen to God, to consider His ways and take time to receive His grace. Mary had a will as if bended to God, waiting in an attitude of loving obedience; Gods will shines forth in her, showing that indeed He is our Father to Whom all things are possible.